General practitioners (GPs) form one of the largest groups to be affected by the Health Ministry's plans to get all healthcare providers on board the National Electronic Health Record (NEHR) system. They run more than 1,600 clinics in Singapore, including solo practices and chains, and are often the first point of contact for many who fall ill. 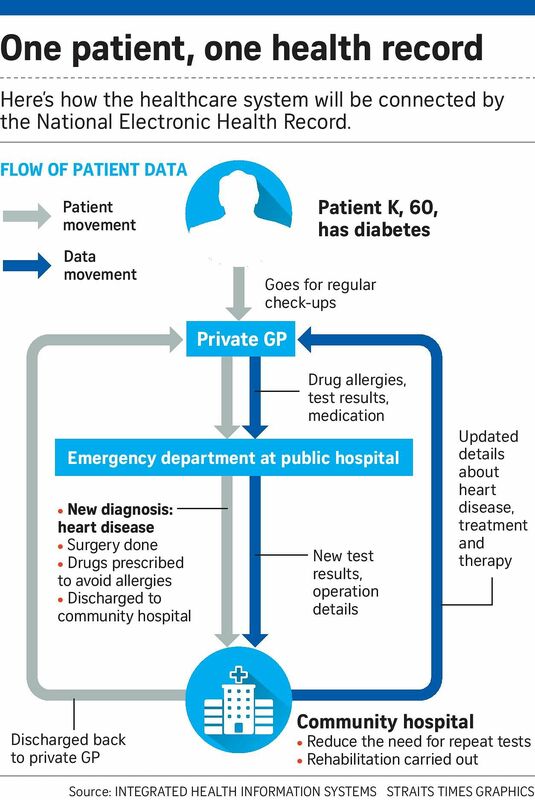 While most acknowledged the new system has its merits, some worry the new rules could mean losing the personal touch with patients. "My patients don't like it when during a consultation, I am facing the computer to look at their medical records and key in data," said Dr Auw Tiang Meng, who runs T M Auw Clinic in Hougang. "They are my regulars, so I know their background." Dr Yik Keng Yeong, who runs Tan and Yik Clinic and Surgery in Bishan, said: "I realise there are lots of advantages because medical care is so fragmented and everybody needs to be kept in the loop. "But it is not that difficult to get information from the patient. We would prefer not to be dealing with the computer when we are dealing with the patient." Doctors said that having to enter such data might lengthen waiting time at their clinics and shorten consultations with patients. There are more than 4,000 private healthcare operators, including GPs, hospitals, dental clinics and hospices. A recent survey of 1,500 such operators done by the Integrated Health Information Systems - the national technology agency for healthcare - found that two in 10 private GPs and specialist clinics still use written medical records, rather than an electronic system. And although most private hospitals keep electronic medical records, their systems may not be compatible with the NEHR. This is the case for the Parkway Pantai group, which runs four private hospitals, a chain of medical clinics, plus laboratory and radiology facilities in Singapore. Mr Phua Tien Beng, who is acting chief executive of the group's Singapore operations division, said it has been in discussion with the authorities on linking its records with the NEHR since June last year. "Enhancing our systems to interface with NEHR and maintaining these systems would certainly come at a considerable cost," he added. A spokesman for Farrer Park Hospital said it has met the authorities on many occasions "to work out technical and administrative issues, including government grants". Doctors who have used the NEHR say it can be useful, especially in an emergency. "It is important to know what medications they are currently taking, which will affect the way we treat the patient," said Dr Lim Jia Hao, a consultant at the Singapore General Hospital's emergency medicine department. "If the patient has been getting medication from a private GP or hospital, they are essentially a blank slate to us." One GP who has made the switch to the NEHR system is Dr Low Kee Hwa, who runs Low Medical Clinic in Kallang Bahru. "After 20 years in practice, I was running out of space to store patient record cards," he said. At the start, Dr Low and his clinic assistants took some time getting used to the new system and were "rather slow". But it has proven to be helpful because many of his patients are elderly and may not know the details of their medication. "The information from NEHR enables me to make a more accurate diagnosis, and ensures my prescription does not interfere with their medical condition or medication they are on," he said.